Strategic Plan: Serve. Excel. Celebrate. Memorable – You’ll brighten Eid al-Fitr for your honorees. And, you’ll help make a lasting difference for our vulnerable seniors and families who struggle with hunger, homelessness, and instability. Personalized – For a donation of only $10 per card, send us a list of those you wish to honor, and we’ll take care of the rest. Our volunteers will handwrite your personal message, address each card, and mail them on your behalf. To ensure timely delivery, submit your order by June 5. From Darkness to Light, an expression that occurs six times in the Qur’an. 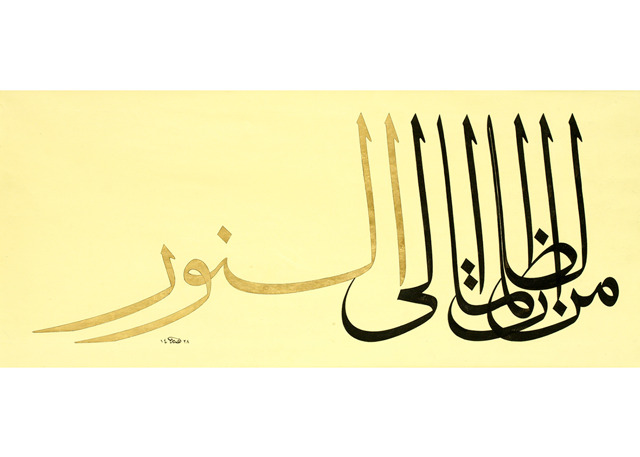 Arabic calligraphy/Muhaqqaq script, ink, and crashed gold on treated paper. 45.5 cm x 90.5 cm, 2013. Courtesy of the artist. Dr. Nassar Mansour, born in Amman, Jordan, is an artist, calligrapher, academic, and designer in the field of Islamic arts, specializing in Islamic calligraphy. He is considered to be one of the most accomplished contemporary Arab calligraphers today, and his celebrated art is in permanent collections of many museums and private collections around the world. In addition to ink on paper, his works extend to other media such as stone, ceramic, mosaic, glass, wood, metals, and more. 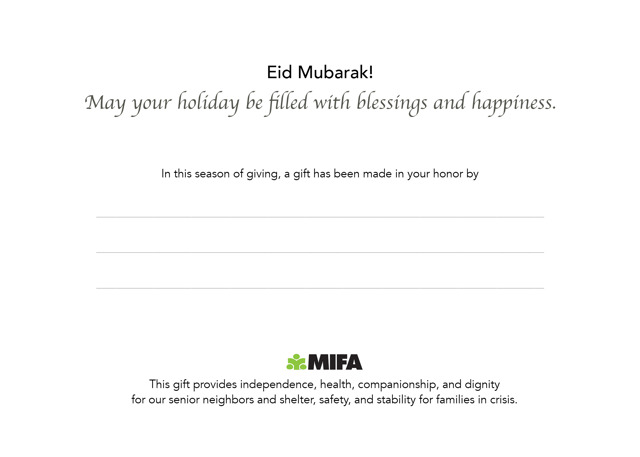 Please note: After completing the donation form below, you will be asked to submit your list of card recipients to Cindy Moore by email at cmoore@mifa.org or by fax at (901) 527-3202.